Order The Connector’s Advantage and get bonuses. The more you buy, the more bonuses you’ll receive! Read more about the bonuses below. Do you prefer an audio book? Are you looking for a new job? Do you want a promotion or to elevate your career? Thinking about starting or growing your business? Relationships will make all the differences in every one of these goals. 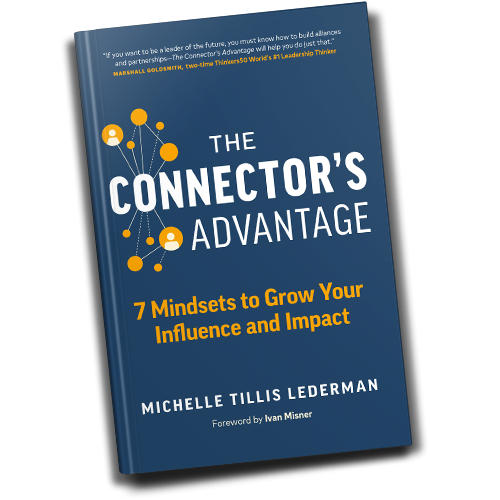 This book is for you; learn how to think and act like a Connector and get that advantage! Have a friend or colleague you want to build a relationship with? Want to reconnect with someone? BOGO: Buy One, Gift One and learn about how each other works, thinks, and communicates to increase productivity and decease interpersonal friction. Strengthen your connection with The Connectors Advantage. Buy Now Claim Your Bonuses! Buy more and get more! If you want to create a relationship focused team and increase sales, referrals, and happiness on the job, then buy a book for everyone on your team. Bulk orders receive discounted pricing! If your team is over 50, receive my video training called Get Known, Get Connected, Get Ahead with 40 minutes of content on creating your personal brand, dealing with difficult people, and building and cultivating real relationships. If your team is over 100, I will provide a private virtual Q&A coaching session to implement the lessons in the book and beyond. One hour coaching sessions start at $1,000 and you will get it for FREE. If your team is over 500, I will create a custom virtual training to implement the lessons in the book and beyond. Custom virtual programs start at $5,000 and you will get it for FREE. Fill out the form below to claim your bonuses for your BOGO purchase of The Connector’s Advantage. If you would like to purchase 50 or more copies, please buy through the links above and then Michelle will follow up with your bonuses. Yes please! Sign me up!No thank you. Join Thousands of Followers for Free VIP Access! Get a free networking assessment, interview checklist, book chapter and more.